Keep your eyes on Peupe (www.peupe.net), a custom-made blogging platform, created by a Kenyan firm called Multiple Choices. 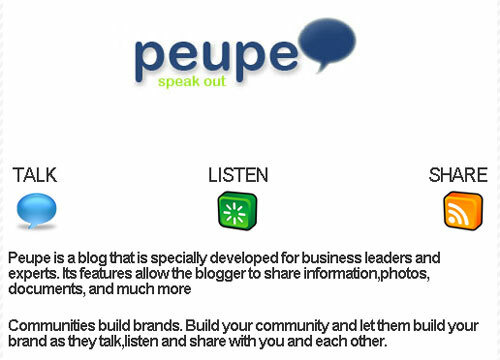 Peupe is Kiswahili for “white place” or a “slate”, and claims to be the first corporate blogging platform in Africa. I’m a little torn on the focus of this post actually… I’m excited about the platform, but I’m equally excited about the guy behind it – John Wesonga. You see, John is blogging too, from his own platform of course, and has this outstanding post today about the mindset of innovation in developers and designers in Kenya. Africa and Kenya specifically cannot be empowered using technology when the mindset we have adopted is one of reuse rather then revolution. If we are truly to be the next frontier of untapped technology then we must strive to build skill and nurture innovation from the onset. I don’t mean to belittle my fellow web techies but the era of plug and play must come to an end, there is nothing wrong with downloading an application to learn the code base but only true knowledge is acquired when I use what I have learned to build something on my own. If we are to mentor and build the coming generation of techies then our skills need to be strong. If we are to be truly the next source of technology talent then we must move past this mindset. John obviously takes this mindset seriously. He built Peupe from the ground up, using open source tools like Ruby on Rails. This is a scrappy startup that knows what they’re doing and is executing on their vision. I had a chance to chat with John via Skype, and I was incredibly impressed with their positioning and the way they are going about marketing their product. Peupe is envisioned as a blog for CEO’s and corporate leaders, as a company we feel that Africa needs to develop a culture of putting their information on the internet through tools such as blogs, groups and social networking applications. We get so much information from external information sources but are yet to build our own information sources as a continent. Peupe is a starting point towards achieving this vision, with CEO’s in Kenya and Africa blogging a community will be built around them as people realise that their is so much value in sharing and reading the words and thoughts of such influential people. Peupe will thus form the platform upon which people can engage and interact with this captains of industry. It is an enormous task which we intend to achieve and I’m always pleased when a popular blogger such as yourself inquire about it. Make sure to read Al Kags intro to Peupe at his blog as well. I know the team behind this project and they are uniquely visionary and very dedicated. Keep an eye out for great things to come out of multiplechoices! This looks great! All the best to the peupe.net folks. hi, am an IT student at IAT and i cant help but appreciate your great works.by the way i watched straight up on wednesday 25 july and you said that you want web designers.am soon going to do web design,so was asking if when i finish i can join you guys.